And a cat and a half. The half cat being the little gray cat that has lived in our garage for the last couple of years. How he survives the winter is beyond me! Well, aside from all the food we give him. But the dogs... one is a minpin (miniature doberman pinscher- who doesn't seem to grasp the "miniature" part!). The other is the goofy black German Shepherd Healer mix we got from the shelter. Blackie is driving me crazy. He is about 100 years old now, in dog years, and beginning to finally show it. His back legs go out from under him randomly when he tries to walk – climbing up the stairs to get up to our bedroom is very much just that – an adventurous climb. And when he goes down, it is more of a tumble. ...as his leg beats on our pineboard floors. And he always seems to purposely pick the stairwell to scratch, where the sound is most amplified and echoes through the house (which he can no longer hear!). So last night he climbs up on our bed as he always does, and for the whole evening we are watching NCIS reruns he sleeps quietly. And then we decide to turn off the lights and go to sleep. It's like when I turned off the light I turned on the itching. All of a sudden he can't get comfortable and crashes off the bed to the floor. Bam! He paces around the room, click click click click, his nails tapping on the wood floor. It's like the Chinese water torture. I pull a pillow over my head. Finally he settles down to go to sleep. He struggles back onto the bed. Back down to the floor. Finally he crashes down the stairs in his almost-controlled tumble... bang bang bang bang bang. He didn't used to bark at all when he wanted something. He'd just stand and look at you. Now he barks. I look at the clock. It's almost 11:00. I drag myself out of bed and go down to the kitchen to see what he wants. Water? The dish is empty, so maybe. I fill it again. Food? No, there is still some food left. Does he want to go outside? I go to put him out but he plants his feet to stop me. So, with nothing else to do, I go back up to bed. I peel myself out of bed again and go to see what he wants now. This time he wants to go out, so I put him on the leash and drag him out the back door. He just sits on the steps. I figure I am up, so I might as well have a bowl of ice cream while I wait for him. Five minutes later he starts to bark so I bring him back in and shuffle back up to bed. From under the covers I hear him struggle up the stairs. It sounds like someone dragging a sack of bowling pins up the wooden stairs. But he makes it to the top and click click click click back into our room and I feel him pull himself onto the bed, circle a couple of times and finally settle in to go to sleep. I shift around trying to find a comfortable sleeping position and by some mystical magic find the most absolute, most comfortable position I have ever found! It is heaven! And then I hear Blackie crash to the floor again. ...his foot bangs on the floor. And then a few seconds later... bang... tumble.... bang... the bag of bowling pins crashes down the stairs. I pull the pillow tighter over my head to try to block out any sound. I put him outside again, this time I pull him down the steps and onto the sidewalk... me in my pajamas and bare feet on the ice cold cement in the middle of November. A few minutes later I drag him back into the house and fume back upstairs and into bed. I don't think I got a whole lot of sleep last night. So finally around 4:00 this afternoon I couldn't stay awake any longer and went up to take a nap. I fell into bed and pulled the covers around me. Blackie at the back door wanting to go out. It's 11:30, and here I am, sitting at the computer. It was an encore performance. Up and down the stairs, in and out of the house. I don't know what to do for him. He is driving me crazy. I can't sleep. "Dear Lord, please ease Blackie's torment, whatever it is. Give him peace, give him rest. Heal whatever it is that is wrong." Yeah, I know, a completely ridiculous thing to be praying for – praying for a dog. And completely selfish – I needed to get some SLEEP. Surely God has more important things to tend to, running the UNIVERSE and all. But I had just been to a Bible study at church earlier this evening, where we are studying the Gospel of Mark. Tonight we read four stories of Jesus' power. In the four stories, one right after the other, Jesus demonstrates his power over the wind and the waves, His power to drive out unclean spirits, His power to heal the sick, and finally His power to bring the dead to life. And so as I prayed, I knew for absolute certainty that Jesus COULD ease Blackie's torment. I had no doubt at all. I knew for absolute certainty that God heard my prayer. It wasn't, well, maybe I'll get through. Maybe God is listening. Maybe God will have time for me. Maybe God has a moment. Maybe I am worthy of His attention. 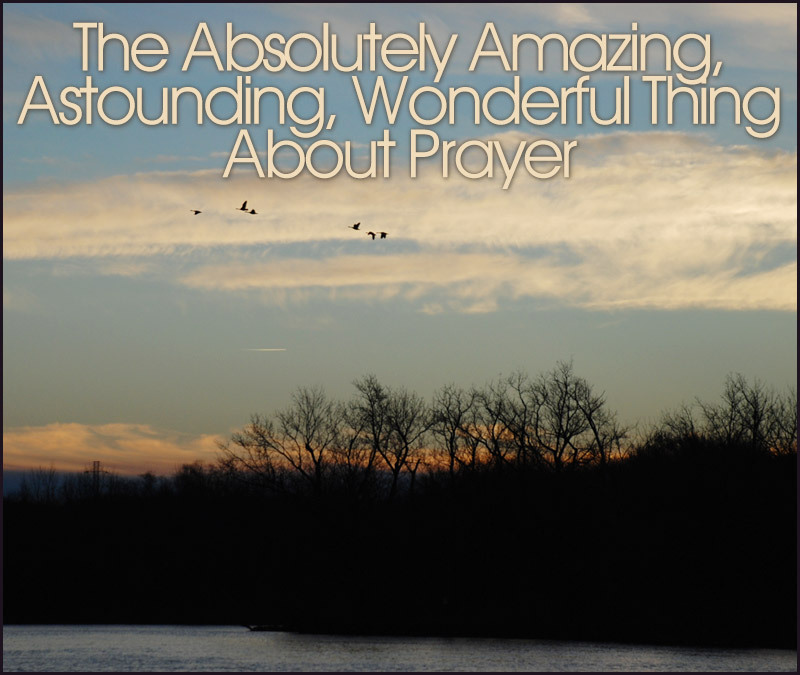 The absolutely astounding thing is that God hears my prayers - our prayers - ALWAYS. Not because I am good enough, or worthy to be listened to – but because it is just WHO GOD IS. Not because I am good – but because GOD IS GOOD. ...I had to jump up and come down here and write it down! So, I don't know if Blackie is up there scratching away - or sleeping peacefully. I don't know how God answered my prayer. God may not always answer my prayers the way I want or hope or expect. But I DO KNOW THIS. And He ALWAYS responds in LOVE. Always. Every time. Without fail. I may not see it just yet. I may not understand it – but I know it is true. He can't help Himself. It IS who God IS. That reality blows me away.